Two militants from the KDPI, were killed in recent clashes with the PKK, on the Iran-Iraq border on Sunday. Four PKK members were also reportedly killed in the exchange of the fire with the KDPI in the border town of Kelashin. The dispute was believed to have started after the angry protests were launched over the claims that two officials had raped a Kurdish girl in the Iranian provinces of Mahabat two weeks ago. 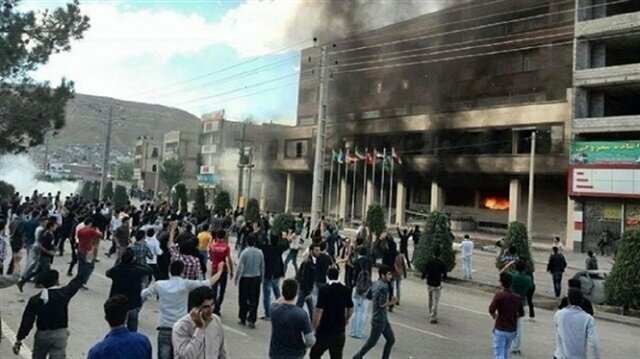 The PKK attacked the military wing of the Kurdistan Democratic Party of Iran, who have tried to organize themselves in the predominantly Kurdish regions in Iran. Political sources in the region suggest the PKK has been alarmed in Qandil about Iran and in Damascus for Syria. When an Iranian opposition group approached the borderline, they placed two local political actors, Mahmut Osman and Muhammed Pencivini, from the district in to mediate the argument that started hours ago and turned into a small clash. When Qandil would still not let its top level responsible PKK people be used in any way against Iran, it was reported that the clashes started again. Two helicopters carrying senior Iranian military officials arrived in Qandil after the clashes erupted between the PKK and KDPI. There has been reports that Iran is preparing to deploy 12,000 extra troops along its border with Iraq. Mohammed Salih, the foreign relations officials of IKDP, said that the PKK did not allow them to send their forces to the border with Iran. “We have sent, as mediator, leading figures of Kurdish policy, but they preferred to remain silent on every condition,” he said. Rusten Jihangiri, the head of Military Commission of KDPI, accused the PKK of closing all dialogue channels despite all efforts they have exerted. “We are in favor of overcoming all barriers through dialogue means. We are trying to serve people and supporting members of the party in Iran,” he said. Jihangiri recalled that the only one foe is the Tehran regime for KDPI. “We do not want to fight anybody else but Iran,” he said. Meanwhile, Patriotic Union of Kurdistan, KYB, criticized the clashes which left two peshmerges dead. The party's foreign relations official, Sadi Pire, said that his party was seriously concerned for the clashes. Pire called on the autonomous Kurdish government to interfere into the disturbing developments in the region, saying neither the PKK nor the IKDP was the the dominat power in region where they were fighting.